Castor oil’s (Ricinus communis (unique oleo chemical properties make it a potential feedstock for a variety of end applications. With the world becoming more environment conscious and with increasing replacement of synthetic products with naturally derived products, castor oil-based derivatives are increasingly attractive markets worldwide. The oil and its derivatives are being used in over 100 different applications, as well as the use of Castor as rotation crop, organic amendment or "Castor oil cake" usage, as a viable suppressant of Root Knot nematodes. IBG developed castor program in Panama and Haiti as well as a research center in Israel. 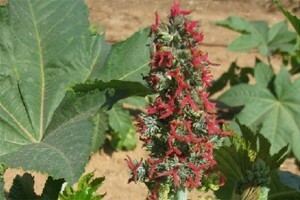 IBG offer the client castor as a crop alternative development, growing protocol, training and online assistance.